Answer to illusion #20: How Can This Be True? 20. How can this be true???? Have a look at the picture (click to enlarge.) All the lines are straight, the shapes that make up the top picture are the same as the ones in the bottom picture so where does the gap come from???? If you can't see the solution by looking you could try printing it and with your eye close to the page looking along the diagonals. 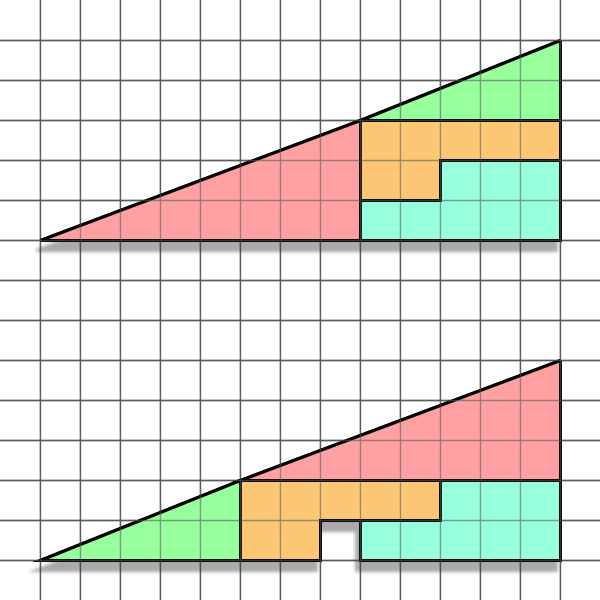 Hence the gradient of the green triangle is greater than that of the red triangle. 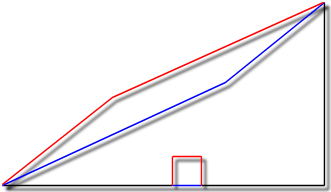 In summary the missing square in the bottom triangle is made up for by the fact that it's hypotenuse bends out where as for the top triangle it bends in.